Trainer Danny O'Brien knows he has the right horse in Shamexpress to take to England for the 1000m King's Stand Stakes at Royal Ascot next month. "He's a Newmarket (Handicap) winner. The last 10 Newmarkets would be stronger than any of the last 10 King's Stands," O'Brien said yesterday. The trainer said it was a misapprehension that because Shamexpress was contesting an overseas race, it had to be a stronger field. "The highest-rated sprint in the world each year is the Lightning Stakes. He's not stepping up in class at all. The hardest sprint races are here," O'Brien said. Shamexpress has not started since he won the Newmarket on March 9, when he ran on strongly to defeat Moment Of Change. O'Brien said the biggest test for Shamexpress would be going from a handicap to weight-for-age. O'Brien said the three-year-old had galloped strongly yesterday at Flemington and would have a jumpout on Friday and one next week before flying out on June 5. "He's in really good shape," he said. This will be O'Brien's third trip to Royal Ascot. In 2006 he took Glamour Puss, who finished seventh in the King's Stand and 10th in the Golden Jubilee Stakes. And two years ago Star Witness ran second in the King's Stand and third in the Golden Jubilee. O'Brien pointed out that Shamexpress was a Newmarket winner while Star Witness finished only seventh in the race before heading to England. He said Shamexpress would also run in the July Cup at Newmarket before heading back to Australia and he definitely would not be retired after his trip to England. Shamexpress will be ridden in England by Craig Newitt, who won the Newmarket on him. 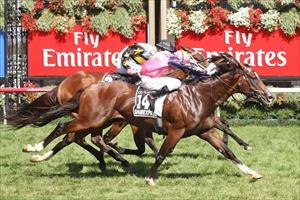 Shamexpress is $11 fourth favourite for the King's Stand behind South African sprinter Shea Shea.